1. As always, we begin with my GIVEAWAY for the week. This week I bring you Chocolate + Caffeine + Energy = Energems! Enter to win here. Ends 11/3. US only. 2. My good friend Jen of Running with the Girls and fellow Spandits ambassador has 2 GIVEAWAYS for you this week! The first is for WIN detergent which WILL get your stinky clothes clean. Enter to win here. Ends 11/1. She is also giving away a Words to Sweat By bracelet of your choice! 3. Julie at Life Simply with Julie also has 2 GIVEAWAYS for you this week. Enter to win here. Ends 11/4. She is also giving away EnergyBits (2 winners)! Enter to win here. Ends 11/3. 4. Christiana at Spilling Coffee n Dropping Things is hosting her first GIVEAWAY and she is giving away Manitoba Hemp Hearts. 5. Lindsay at Fit and Awesome is giving away a $150 gift card to Foot Locker. Enter to win here. Ends 10/31. 6. The ladies over at Scoot A Doot are giving away a pair of Pro Compression socks with a free entry for NYC Marathoners! Enter to win here. Ends 11/2. 7. Katie at Gettin' my Healthy On is giving away Lara Bars and Renola! 8. Jeremy from Confessions of an Amateur Blogger and Run Eat Tweet AZ is reviewing and giving away AZ favorite, Huppy Bars. Enter to win here. Ends 10/31 at 7:00a.m. 9. 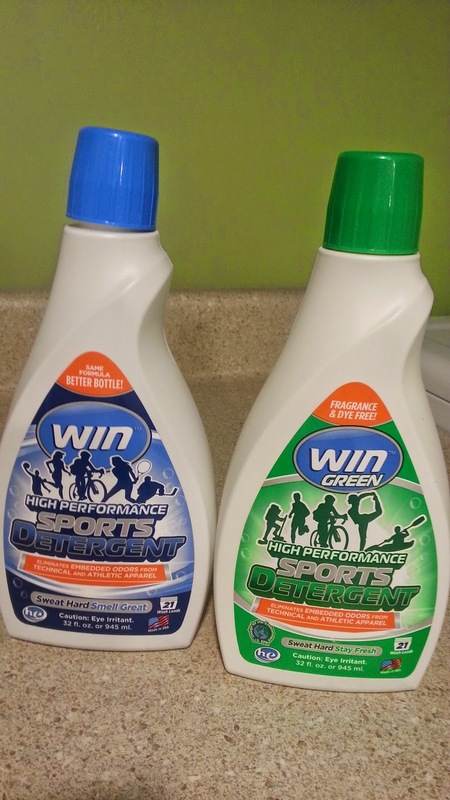 Courtney at the Tri Girl Chronicles is also giving away WIN detergent to help get the stink out! 10. Debbie from Live from La Quinta is giving away Lara Bars and Renola and promoting National Take a Hike day! 11. Annmarie at Fit Foodie Mama has 2 GIVEAWAYS for you this week. The first is for the Vegan protein smoothie pack from Puritan's Pride. She is also giving away New Grip Lifting Power Pads. 12. Ashley at A Lady Goes West has a $50 lululemon gift card for you to win. 13. Lora at Lora Hogan is giving away a Pura Vida bracelet. 14. Nicole at FitFul Focus is giving away a NuNaturals Stevia prize pack to 4 winners. 15. Denise at a Healthy Disney Family is giving away a Puritan's Pride protein smoothie pack. 16. Susie at SuzLyfe is giving away 2 entries to a Spartan Race and a variety pack of Quest Bars. 17. Brienne at Lean Clean and Brie is giving away a soy based smoothie pack from Puritan's Pride. 18. Amanda at Adventures with FitNYX is giving away a sample pack of Manitoba Hemp Hearts. Enter to win here. Ends 11/5. 19. Kaila at Healthy Helper Blog is giving away a Sizzlefish sampler pack. 20. Erica from Erica Finds has 3 GIVEAWAYS for you this week. First, she is giving away an Aurorae Yoga Mat towel. Enter to win here. Ends 10/30. Next, she is giving away the October Klover Box. She is also giving away Race Food from RacePak. 21. Finally, Jess from A Little More Each Day is giving away a Southern Living cookbook. And there you have it, 21 Bloggers. 26 amazing prizes. 1 Post. Which ones will you enter? Make sure you come back and tell me if you win! Also, San Diego fitness lovers: Have you always wanted to know the proper way to stretch before a run? After a run? How about foam rolling? All of these questions will be answered with wine at Road Runner Sports on Sunday 11/2 form 4-6 p.m. Here is the link: https://www.eventbrite.com/e/ladies-healthy-happy-hour-tickets-13288968663 and there will be prizes! Mamma Chia will also be there with samples! Thanks Lora! And thanks for being a part of it! Thanks for including my Lululemon giveaway. This is a great round-up of blog contests. Good work!